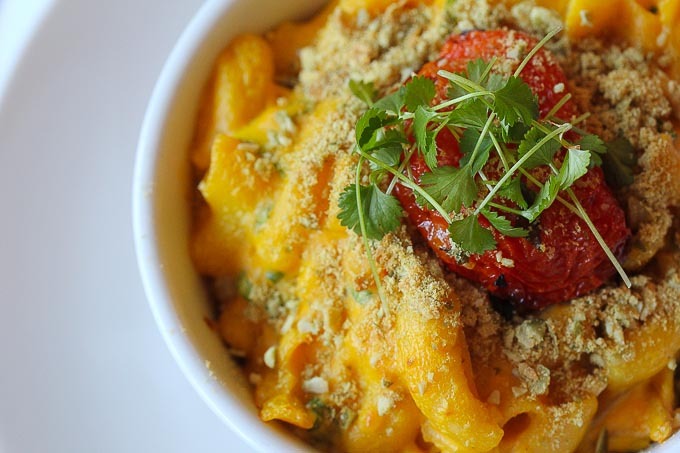 Mac-n-cheese is such a nostalgic childhood food, but the combination of pasta, dairy and butter is a nutrition train wreck. Commercially available, processed versions are even worse! It’s the kind of dish that deserves a green make-over. 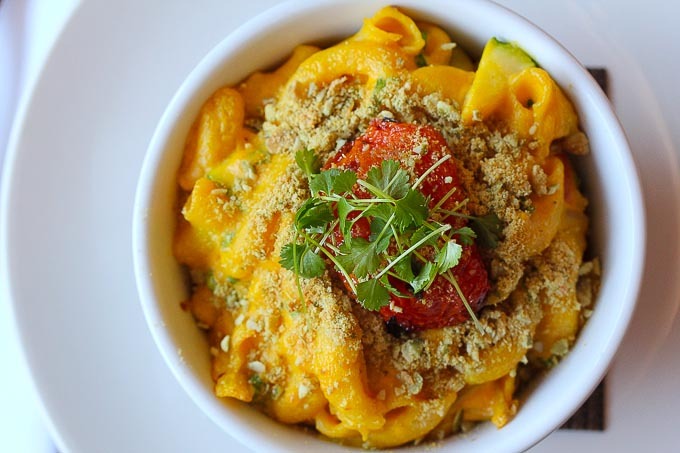 My vegan mac-n-cheese recipe uses a gluten free quinoa elbows and a cashew based cheese sauce (that can double as a great nacho cheese). I recommend just heating this up in a sauce pan rather than baking it, the way you would a traditional mac-n-cheese. It will dry out and get too thick! When cooking with cashew milk, it’s important to always have a little water or extra cashew milk on hand in case it starts thickening too quickly. Blend everything until smooth in a blender. Set aside until ready to use. Cook off the package of gluten free macaroni until al dente. In a sauce pan add the cheese sauce and 1 cup of the cashew milk. Heat slowly until the mixture begins to thicken and become creamy. Add more cashew milk if necessary to achieve your desired consistency. Cashew milk thickens very quickly when you cook with it so be sure to keep an eye on your pot and keep the heat low. When everything is nice and creamy, pour the mixture into a 9"x 9" baking pan and bake at 350 degrees for 15 minutes. You can mix in other ingredients to give unique character your dish-mushrooms, tomato, broccoli, spinach etc...Truffle oil makes a delicious addition as well. What kind of cashews do you use? Are they raw or roasted ? Salted or unsalted? Looking forward to making recipe! Thanks. Hi Aimee! We have a new class schedule out on our website! And thanks for making this recipe! This recipe sounds very good but I have a few questions. Is it 1/2 of a bell pepper, chopped or 1/2 cup bell pepper? Seems to be something missing. Also, how do you make the cashew milk? You list the ingredients and I’ve heard of making nut milks easily but I’ve never done it. Thanks very much for your help. Hi there! It’s 1/2 a medium bell pepper (chopped) for the sauce and the nut milk is just to thin it while you heat it up in the pan. You could use boxed coconut milk, almond milk etc…or make your own. You make nut milk by putting 1 part soaked nuts and 3 or 4 parts water in the blender and straining out the pulp! If you want it to be thicker use less water. You could also use water in the recipe instead of the milk because it’s to thin it only. Thanks so much for the info. I haven’t tried it at your restaurant but the recipe sounds great and I look forward to making it! Your dishes are delicious. P.S. I just saw my comment posted – it posted as 4 hours later than when I actually sent it. Very strange! Also, one tip for those who are gluten free – I will be using a brand of pasta like Tinkyada that is made from brown rice instead of Ancient Harvest. Many people who are gluten sensitive are also sensitive to corn and Ancient Harvest’s first ingredient is corn. Years ago, they didn’t print “corn-quinoa pasta” on the front. I bought it because of the big Quinoa lettering on the front, ate it and was in bad shape. Thank you so much for this recipe! I made it this weekend and LOVED it! Thanks for the truffle oil tip, that took it to a whole new level. Thanks, Sarah! I’m glad you liked it!